Reason for Reading: Sassymonkey recommended it. A real-life Suite Française, this riveting diary by a key female member of the French Resistance in WWII is translated into English for the first time. In the throes of their struggle for freedom, the members of Humbert’s group were betrayed to the Gestapo; Humbert herself was imprisoned. In immediate, electrifying detail, Humbert describes her time in prison, her deportation to Germany, where for more than two years she endured a string of brutal labor camps, and the horror of discovering that seven of her friends were executed by a firing squad. But through the direst of conditions, and ill health in the labor camps, Humbert retains hope for herself, for her friends, and for humanity. Originally published in France in 1946, the book was soon forgotten and is now translated into English for the first time. 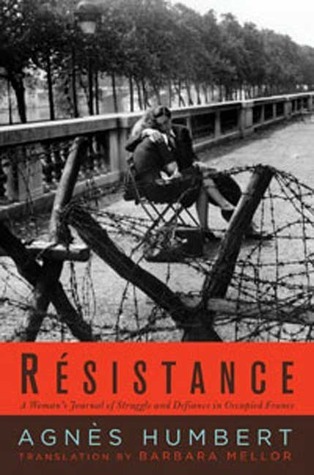 Résistance is more than a firsthand account of wartime France: it is the work of a brave, witty, and forceful woman, a true believer who refused to go quietly. I have read a lot of World War 1 and 2 books over the years, but this book seemed to slip through the cracks. When Sassymonkey reads something she thinks would interest me, though, I always get an email because she knows I like the two time periods. When I received the email about this book I immediately went to check the library website. I was thrilled to see they had it and when I brought it back I suggested it to one of the librarians that always asks if I have read anything interesting lately. I really hope she read it. I really hope that many people read this book. I am going to tell you right now that I felt so small reading about the heroic life that this woman lived during a difficult time in earth's history. I would love to think that faced with the same I could be like her. I have to say that as I write this review I am in my warm living room, on my brand new computer, listening to 'The Sound of Silence' by Simon & Garfunkel, wearing my comfy clothes, waiting for supper to be finished, and for the cc to get home from work so we can eat it. I am living in the lapse of luxury compared to what Agnes Humbert went through. She lived in occupied France and was a member of the Resistance. She was caught, though, and found herself living in what can only be termed as hell. In the beginning she was able to keep a diary of the horrors of living in jail, but in the later part of her book it is told through memories and the few thoughts she was able to sprawl in a book she was allowed to read. It just amazes me that this book was forgotten... I am not sure how you can forget something like this. I read it back and August and I can still recall in vivid detail the terrible things that happened to her. I have to say the physical trauma that Agnes suffered would have broke most people. She was beaten, half-starved, and the temporary blindness she suffered as a result of the rayon plant was all described in horrific detail. Many of her fellow resistance members were also executed. I have to admit that on the one hand it is terrible to die; but on the other hand when she was sentenced to hard labour it was definitely hard. There was little to no mercy. The few moments of kindness will actually amaze you in the bleak landscape she experienced. The other thing is that Agnes did not give in. She was never broken. She was a member of the Resistance and she was determined to resist anyway she could during her imprisonment. I know that I will never be able to do credit to this book. It was absolutely amazing and if you have any interest at all in this time period you should rush out and get a copy of this book. It is the first hand count of World War II, but it is also from the viewpoint of a woman that resisted the German occupation of France anyway that she could. She was a hero and we should all salute people that can be this brave under such horrific circumstances. I have a lot of depression and so I would have to be in an exceptional mood to read something like this..but you do make it sound like an excellent read! Ah, this one sounds very good. I agree that we should salute those with the kind of courage required for these circumstances. This sounds excellent and right up my alley! Adding this to my wishlist. It sounds so interesting and so heartbreaking. I'll add your review to War Through the Generations as well. Btw...I hope you got my e-mail with the WWII recommendations! I've read so many books about this period of history that I am getting a bit bored of them. Despite this I am drawn to this book. It sounds especially poignant. Thanks for drawing it to my attention. **Aarti: Sorry! I heard about it, I requested it, I read it. I had no idea you had it! That's too bad you couldn't get through it. I liked it very much. **Jenclair: I think you would like this one judging by other books you have read. **Anna: I hope you get a chance to read it and enjoy it! I like to read this genre, and this sound incredibly interesting read, thank you for bringing it to our attention.